Recently, it has emerged that extracellular proteases have specific regulatory roles in modulating immune responses. Proteases may act as signaling molecules to activate the Raf-1/extracellular regulated kinase (ERK)-2 pathway to participate in mitogenesis, apoptosis, and cytokine production. Most reports on the role of protease-mediated cell signaling, however, focus on their stimulatory effects. In this study, we show for the first time that extracellular proteases may also block signal transduction. We show that bromelain, a mixture of cysteine proteases from pineapple stems, blocks activation of ERK-2 in Th0 cells stimulated via the TCR with anti-CD3ε mAb, or stimulated with combined PMA and calcium ionophore. The inhibitory activity of bromelain was dependent on its proteolytic activity, as ERK-2 inhibition was abrogated by E-64, a selective cysteine protease inhibitor. However, inhibitory effects were not caused by nonspecific proteolysis, as the protease trypsin had no effect on ERK activation. Bromelain also inhibited PMA-induced IL-2, IFN-γ, and IL-4 mRNA accumulation, but had no effect on TCR-induced cytokine mRNA production. This data suggests a critical requirement for ERK-2 in PMA-induced cytokine production, but not TCR-induced cytokine production. Bromelain did not act on ERK-2 directly, as it also inhibited p21ras activation, an effector molecule upstream from ERK-2 in the Raf-1/MEK/ERK-2 kinase signaling cascade. The results indicate that bromelain is a novel inhibitor of T cell signal transduction and suggests a novel role for extracellular proteases as inhibitors of intracellular signal transduction pathways. Proteases contribute to effective immune responses, although their role is commonly thought of as degradative, such as in the destruction of cell targets by lymphocytes and NK cells (1), or the cleavage of cellular substrates during apoptosis (2). Recently, however, it has become apparent that proteases also convey hormone-like signals and stimulate intracellular signal transduction via specific cell surface receptors (3). Thrombin, for example, a protease involved in the blood coagulation cascade, is mitogenic in many cells and activates the Raf-1/extracellular regulated kinase-2 (ERK-2)2 pathway leading to DNA synthesis, cell growth, proliferation, and differentiation (4). Thrombin activation is mediated via proteinase-activated receptor (PAR)-1, a member of the family of PARs (4). The proteases, plasmin, granzyme A, and cathepsin G also activate PAR-1 and stimulate signal transduction (5, 6, 7). Bromelain is a mixture of cysteine proteases obtained from pineapple stems (Ananus comosus) (8) that has varied stimulatory effects on leukocyte populations in vitro. It has been shown to increase CD2-mediated T cell activation, enhance Ag-independent binding to monocytes (9), and increase IFN-γ-dependent TNF-α, IL-1β, and IL-6 production in PBMC (10). Bromelain-treated RBC are also used in murine studies of the role of CD5+ B cells in autoimmunity (11). Bromelain’s effects have previously been attributed to its degradative action at cell surfaces, whereby it either removes surface molecules or, alternatively, reveals ones that already exist on cell membranes, thereby altering receptor-ligand interactions (9, 12, 13). Recently, however, we showed that bromelain also exerted effects independent to that mediated by the removal of cell surface molecules (14). We showed that bromelain inhibited the action of cyclic nucleotide agonists and calcium agonists that directly stimulate intracellular signaling pathways and bypass cell surface receptors in their action (14). Therefore, to further investigate the possible hormone-like effects of bromelain on intracellular signaling, we studied its effects on TCR/CD3 signaling and IL-2 production. Significant progress over recent years has led to the understanding of biochemical events that occur following TCR engagement (15). Therefore, TCR signaling provides an excellent model for elucidating the effects of biologically active compounds. Effective T cell activation requires two signals. The first signal is generated by the TCR/CD3 complex after engagement with Ag peptide presented by the MHC expressed on APC (15). The second, costimulatory signal is generated by ligation of CD28 receptors on T cells with the B7 family of ligands on APC (16). A key element in the signaling pathway involved in transducing receptor-initiated signals to the nucleus is the family of mitogen-activated protein kinases (MAPK) (17). The best studied of these kinases are ERK-1 and ERK-2. ERKs are serine/threonine kinases that are activated when phosphorylated on tyrosine and threonine residues (18). In vitro, this activation is reversed if either residue is dephosphorylated (19). A relatively new member of the MAPK family is c-Jun NH2-terminal kinase (JNK) (20). ERK activation is dependent on p56lck (21) and coupling of the TCR/CD3 complex to p21ras, with subsequent activation of the Raf-1/MEK1/ERK kinase cascade (22). JNK activation also requires p21ras and signals generated by the CD28 costimulatory receptor (20, 23). Activated ERK phosphorylates Elk-1 (24), which, in turn, mediates induction of c-fos activity (25). Following phosphorylation of c-jun by JNK (26), activated c-fos and c-jun combine to form the AP-1 protein required for IL-2 synthesis (27). All the above events require tyrosine phosphorylation, as inhibitors of protein tyrosine kinases inhibit many events associated with TCR stimulation (28, 29), including T cell activation and IL-2 production. In this report, we show that bromelain inhibits ERK-2 activation in Th0 cells stimulated via the TCR, or with combined PMA plus ionophore. In association with decreased ERK activity, bromelain decreased IL-2, IFN-γ, and IL-4 mRNA accumulation in Th0 cells stimulated with PMA plus ionophore, but did not affect cytokine mRNA accumulation in cells stimulated via the TCR. This data suggests the existence of a TCR-activated, ERK-2-independent pathway involved in cytokine production in T cells. Bromelain did not appear to act on ERK-2 directly, as studies indicate that it also inhibited p21ras activation, an effector molecule upstream from ERK-2 in the Raf-1/MEK1/ERK kinase cascade. These results indicate that bromelain is a novel inhibitor of T cell signal transduction, and findings also suggest a novel role for extracellular proteases as inhibitors of intracellular signal transduction pathways. Anti-CD3ε-chain mAb (145-2C11) was purchased from PharMingen (San Diego, CA) and goat anti-hamster IgG Ab was from Sigma (Dorset, U.K.). Mouse anti-phosphotyrosine mAb (4G10) and mouse anti-MAPK R2 (ERK-2) mAb were from Upstate Biotechnology (Lake Placid, NY). Anti-pan-ras (Ab-4) mAb was from Oncogene Research Products (Cambridge, MA). Goat anti-mouse and goat anti-rabbit IgG Ab conjugated to HRP were from Bio-Rad (Hertfordshire, U.K.). Rabbit polyclonal phospho-specific MAPK IgG was from New England BioLabs (Hertfordshire, U.K.). Bromelain (E.C. 3.4.22.32; sp. act., 1541 nmol/min/mg) was purchased from Solvay (Hannover, Germany). Trypsin (porcine pancreas, E.C. 3.4.21.4; activity, 5270 nmol/min/mg), E-64 (l-trans-epoxysuccinyl-leucylamido(4-guanidino)butane), PMA, calcium ionophore A23187, and glutathione agarose beads were purchased from Sigma. Other reagents were also from Sigma. Specific activity was determined by monitoring the release of p-nitroaniline from the peptide p-nitroanilide (pNA) substrate Z-Arg-Arg-pNA (30). MAPK activity was determined using a MAPK assay kit (New England Biolabs), which measures the in vitro phosphorylation of the transcription factor Elk-1. The T cell hybridoma GA15 was a generous gift from B. Fox (ImmuLogic Pharmaceutical, Boston, MA). GA15 was generated by fusing the thymoma BW5147 with the Th2 clone F4 specific for keyhole limpet hemocyanin in association with I-Ab, and were maintained as previously described (31). GA15 exhibit a Th0 phenotype as they produce IL-2, IFN-γ, and IL-4 following stimulation with cross-linked anti-CD3ε mAb (31). Jurkat T cells (E6.1) were provided by P. Beverley (Jenner Institute, Berkshire, U.K.). Cells (2 × 107) suspended in RPMI 1640 were treated with bromelain (10–100 μg/ml) diluted in PBS (0.1 M (pH 7.4)) for 30 min at 37°C. Mock treated cells were treated with an equal volume of PBS. At high concentrations of bromelain (50 or 100 μg/ml), cell aggregation occurred, as noted previously (9). Following treatment, cell aggregates were gently dispersed, washed three times, and then resuspended in fresh RPMI. Cells were stimulated via the cell surface with cross-linked mAb to the TCR, or directly, using combined PMA (20 ng/ml) plus ionophore (1 μM) for times shown in figure legends and the text. Stimulation via the TCR was conducted by first incubating T cells on ice for 30 min with anti-CD3ε mAb (10 μg/ml). Excess mAb was then removed by washing once at 4°C, and anti-CD3ε mAb was cross-linked with goat anti-hamster IgG (10 μg/ml) at 37°C. Stimulation was terminated by the addition of ice-cold lysis buffer (25 mM Tris (pH 7.4), 75 mM NaCl, 0.4 mM EDTA, 0.5% Triton X-100, 0.4 mM sodium orthovanadate, 10 mM sodium fluoride, 10 mM sodium pyrophosphate, 10 μg/ml leupeptin, 740 μM PMSF, and 10 μg/ml aprotinin) for 30 min with continual rotation at 4°C. Lysates were clarified (14,000 × g for 10 min), and an equal volume of 2× SDS-PAGE sample buffer (50 mM Tris (pH 7), 700 mM 2-ME, 50% (v/v) glycerol, 2% (w/v) SDS, 0.01% (w/v) bromophenol blue) was added to postnuclear supernatants. Proteins were solubilized at 100°C for 5 min, and samples containing 1 × 106 cell equivalents were resolved by SDS-PAGE. Separated proteins were transferred to nitrocellulose membranes (Bio-Rad), which were then blocked and immunoblotted (21) with the appropriate Abs, as shown in figure legends. Immunoreactivity was determined using the ECL chemiluminescence detection system (Amersham, Arlington Heights, IL). Activated p21ras was detected by a functional assay that detects the interaction between Ras-GTP and the Ras-binding domain (RBD) of Raf-1 (32). Escherichia coli expressing the RBD of Raf-1 fused to GST (GST-RBD) was a gift from D. Cantrell (Lymphocyte Activation Laboratory, Imperial Cancer Research Fund, London, U.K.). Bromelain (0–100 μg/ml)-treated GA15 cells were washed and lysed, as described above. Cell lysates were then incubated with GST-RBD immobilized to glutathione-Sepharose. Bound proteins were eluted with glutathione (50 mM), and subjected to SDS-PAGE and immunoblotting with anti-pan Ras mAb. Bromelain (10 mg/ml) diluted in 3 μM DTT, 100 μM E-64, 60 mM sodium acetate (pH 5), was incubated for 10 min at 30°C. The inactivated bromelain was then dialyzed overnight in PBS at 4°C. A total of 99.5% inactivation of bromelain was achieved as assayed with the Z-Arg-Arg-pNA substrate. 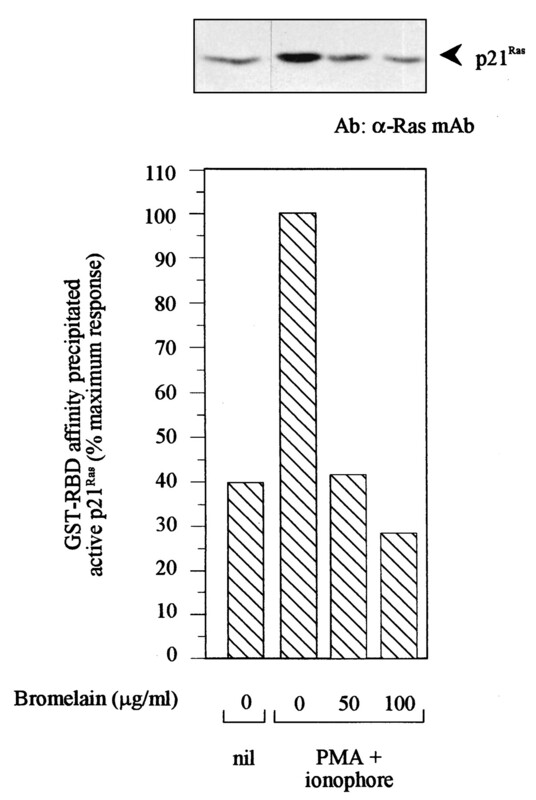 GA15 cells diluted in RPMI were treated with bromelain (50 μg/ml) or PBS at 37°C for 30 min, washed three times in fresh RPMI, and then resuspended in culture medium. T cells were stimulated to produce cytokine mRNA by immobilized anti-CD3ε (4 μg/ml) or combined PMA (20 ng/ml) plus ionophore (1 μM). Anti-CD3ε mAb diluted in PBS was immobilized to 24-well flat-bottom microculture plates (Corning, Corning, NY) by incubation for 16 h at 4°C. Wells were then washed three times in PBS before addition of triplicate cultures of GA15 (2.5 to 5 × 106 cells per well), which were incubated at 37°C in humidified 5% CO2 for 4 h.
IL-2, IFN-γ, and IL-4 mRNA accumulation was measured using a semiquantitative RT-PCR assay, as previously described (33). Significance of differences was determined by Student’s t test for paired observations. GA15 cells were treated with bromelain (50 μg/ml) for 30 min, washed in RPMI, and then cultured in 96-well flat-bottom plates (Nunc, Roskilde, Denmark) at 104 cells per well for 24 h. Cultures were pulsed with 0.5 μCi of [3H]TdR 6 h before harvesting onto glass fiber filters. Before conducting TCR signaling studies, we first confirmed an earlier report that showed bromelain does not cleave the CD3ε chain from T cells (9). FACs analysis of CD3ε chain expression on both naive murine T cells and GA15 that had been treated with bromelain for 30 min (0–100 μg/ml) showed no cleavage of CD3ε, therefore confirming those earlier findings (data not shown). The effect of bromelain on TCR-mediated signal transduction was then investigated by assessing substrate tyrosine phosphorylation of GA15 stimulated with cross-linked anti-CD3ε mAb. Immunoblots of GA15 lysates with specific anti-phosphotyrosine mAb revealed increased tyrosine phosphorylation of multiple proteins, including those of circa 120, 100, 85, 76, 70, 42, and 40 kDa, consistent with phosphoproteins observed in other T cell lines following TCR-ligation (15, 34) (Fig. 1⇓A). Tyrosine-phosphorylated proteins were readily detected between 2 and 5 min following stimulation and remained phosphorylated for at least 10 min (Fig. 1⇓A). GA15 cells stimulated with anti-CD3 mAb alone or cross-linking Ab did not induce tyrosine phosphorylation of any cellular substrate (data not shown). Bromelain pretreatment of GA15 for 30 min caused a dose-dependent reduction in TCR-induced protein tyrosine phosphorylation of a 42-kDa phosphoprotein (Fig. 1⇓B). At a bromelain concentration of 100 μg/ml, tyrosine phosphorylation was reduced by 87%, as determined by densitometry. Bromelain did not markedly affect tyrosine phosphorylation of other TCR-induced phosphoproteins, suggesting a selective mode of action. The effect of bromelain on TCR-induced or PMA plus ionophore-induced substrate tyrosine phosphorylation. A, T cells were stimulated with cross-linked anti-CD3ε mAb for 0–20 min. B and C, T cells were treated with bromelain (0–100 μg/ml) for 30 min, washed, and then stimulated with cross-linked anti-CD3ε mAb or combined PMA plus ionophore for 5 min. D, T cells were treated with bromelain or mock-treated with PBS, washed, and then stimulated with either PMA alone, ionophore alone, or PMA plus ionophore for 5 min. Following stimulation, cells were lysed, and postnuclear supernatants were subjected to SDS-PAGE and immunoblotted using anti-phosphotyrosine mAb, phospho-specific MAPK Ab, or anti-ERK-2 mAb, as indicated. Arrowheads denote anti-CD3ε mAb-induced tyrosine phosphorylation. Results shown are from one experiment that is representative of five conducted. 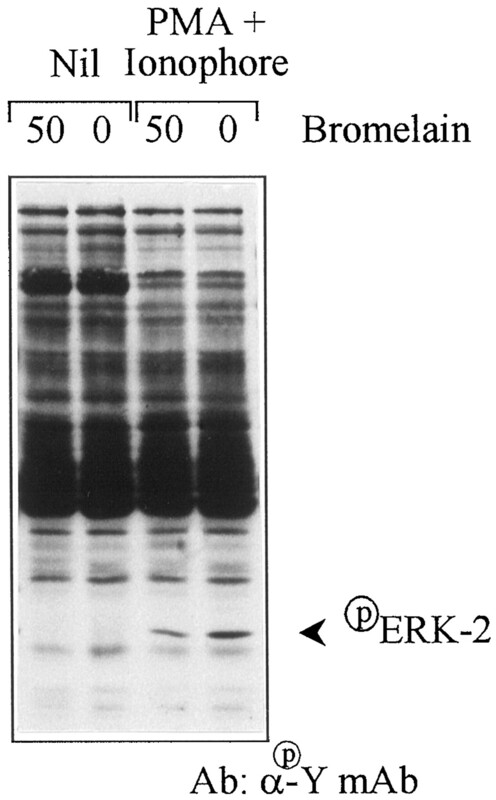 We suspected that the 42-kDa phosphoprotein was the MAPK ERK-2, so we conducted immunoblot analysis with specific anti-ERK-2 mAb and anti-phospho MAPK Abs, which specifically detects ERK-1 and ERK-2 only when catalytically activated by phosphorylation at Tyr204. Immunoblotting confirmed that the p42-kDa phosphoprotein was indeed ERK-2 and that bromelain inhibited its mobility shift, which is characteristic of ERK-2 activation (Fig. 1⇑C). To investigate whether bromelain could, in addition to blocking TCR-mediated T cell signaling, also prevent TCR-independent signaling, we examined its effect on PMA plus ionophore-induced tyrosine phosphorylation. Phorbol ester plus ionophore stimulation of T cells act synergistically to reproduce many features of TCR stimulation, such as IL-2 secretion, IL-2 receptor expression, and T cell proliferation (35, 36). Phorbol esters mimic Ag receptor triggering and bypass TCR-induced protein tyrosine kinases to activate ERK-2 by a direct agonist action on PKC and p21ras. Ionophore A23187 induces increased intracellular release of Ca2+ and therefore mimics the action of inositol 1,4,5-trisphosphate (IP3). Again, bromelain dose-dependently reduced tyrosine phosphorylation of ERK-2 and prevented its mobility shift (Fig. 1⇑C). 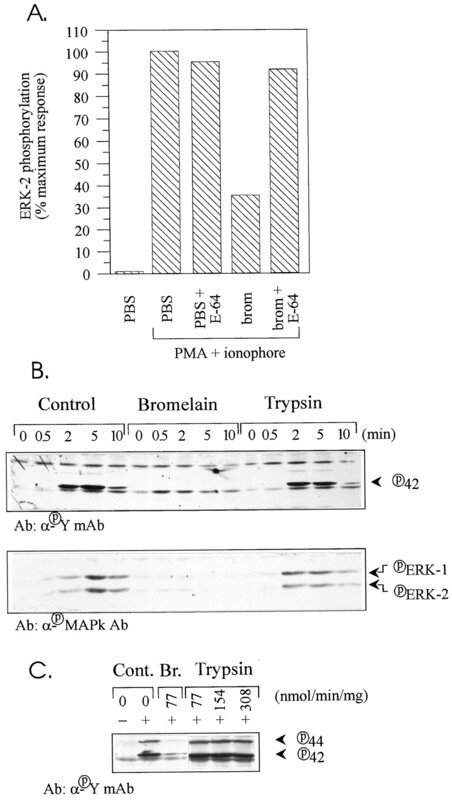 Stimulation with either PMA or ionophore alone resulted in marginal, bromelain-sensitive, phosphorylation of ERK-2 (Fig. 1⇑D). This result confirms previous observations of a synergistic action of phorbol esters plus ionophore on T cell signaling (35, 36) and also shows that bromelain blocks signals generated by PMA alone and ionophore alone. To exclude the possibility that differences in kinetics of the response account for our observation, longer times of activation were examined. Even after 60 min of stimulation, we observed that bromelain inhibited phosphorylation of ERK-2 (data not shown). Activation of ERK-2 induces phosphorylation and transcriptional activation by Elk-1 (24). Similarly, inhibitors of ERK-2 would be expected to block activation of Elk-1. To confirm that the ability of bromelain to block tyrosine phosphorylation of ERK-2 also correlated with inhibition of effector function of the enzyme, the ability of ERK to regulate phosphorylation of the transcription factor Elk-1 was investigated. Kinase assays were conducted on bromelain-treated GA15 cells that were then stimulated with PMA plus ionophore. In control cells, combined PMA and ionophore induced phosphorylation of Elk-1 (Fig. 2⇓) and reduced its electrophoretic mobility (data not shown). Bromelain treatment decreased phosphorylation of Elk-1 (Fig. 2⇓) and its retardation in electrophoretic mobility, thereby confirming that the bromelain-mediated inhibition of ERK-2 tyrosine phosphorylation results in a corresponding reduction in biological activity. ERK-2 from bromelain-treated T cells is reduced in its ability to phosphorylate Elk-1. T cells were treated with bromelain (0–100 μg/ml) for 30 min, washed, and then stimulated with PMA plus ionophore for 5 min. Cells were then lysed, and postnuclear supernatants were immunoprecipitated with phospho-specific MAPK Ab. 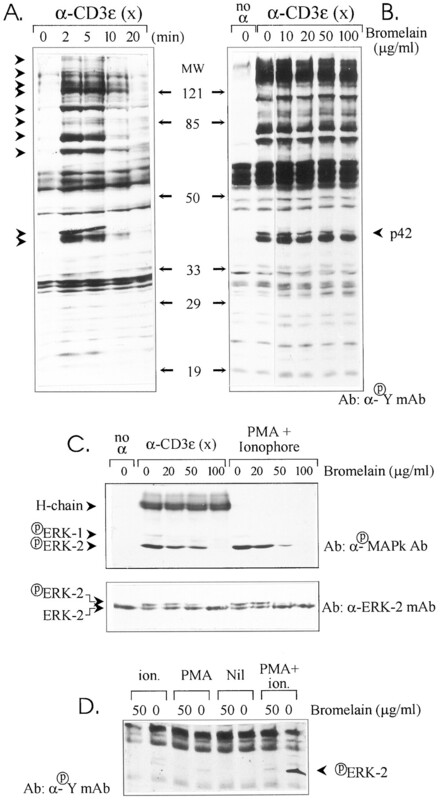 Immunoprecipitated ERKs were then incubated with an Elk-1 fusion protein and assessed for Elk-1 phosphorylation using phospho-specific Elk-1 Ab. Phosphorylation of the Elk-1 substrate was quantitated by densitometry of bands revealed by chemiluminescence. Results shown are from one experiment that is representative of three conducted. To determine whether the inhibitory effect of bromelain was dependent on its proteolytic activity, we used a specific cysteine protease inhibitor, E-64, to inactivate its protease activity (37). GA15 cells were treated with inactivated bromelain (50 μg/ml) and compared with proteolytically active bromelain and mock-treated T cells stimulated with PMA plus ionophore. Inactivation of the protease activity of bromelain completely abrogated its inhibitory effect on ERK-2 phosphorylation (Fig. 3⇓A). E-64 treatment of GA15 did not affect PMA plus ionophore-induced T cell signaling. These data indicate that the inhibitory effect of bromelain on ERK is dependent on its protease activity. Inhibition of ERK-2 phosphorylation is dependent on specific proteolytic activity. A, T cells were treated with bromelain (50 μg/ml), E-64-inactivated bromelain (50 μg/ml), or mock treated for 30 min. Cells were then washed and stimulated with PMA plus ionophore for 5 min. B, GA15 cells were treated with bromelain (50 μg/ml; sp. act., 77 nmol/min/mg), proteolytically equivalent amounts of trypsin (sp. act., 77 nmol/min/mg), or mock-treated for 30 min. Cells were then washed and stimulated with PMA plus ionophore for the times indicated. C, GA15 cells were treated with bromelain (50 μg/ml; sp. act., 77 nmol/min/mg; Br. ), trypsin (sp. act., 77–308 nmol/min/mg), or mock treated for 30 min (Cont.). Cells were washed and stimulated with PMA plus ionophore (+) or media alone (−) for 5 min. Cells were lysed, and postnuclear supernatants were subjected to SDS-PAGE and immunoblotted with anti-phosphotyrosine mAb or phospho-specific MAPK Ab as indicated. Results shown are from one experiment that is representative of four conducted. We next confirmed that the inhibitory effect of bromelain on ERK-2 phosphorylation was not a nonspecific enzyme effect, by treating GA15 cells with proteolytically equivalent amounts of trypsin, as determined by the Z-Arg-Arg pNA substrate. Both enzymes were tested at a specific proteolytic activity of 77 nmol/min/mg. Trypsin, a serine protease, shares common cleavage sites to bromelain, but is not inactivated by E-64 (37). Trypsin did not inhibit tyrosine phosphorylation of ERK-2 (Fig. 3⇑B). A specific activity of trypsin that was two or four times that of bromelain still had no effect on ERK phosphorylation (Fig. 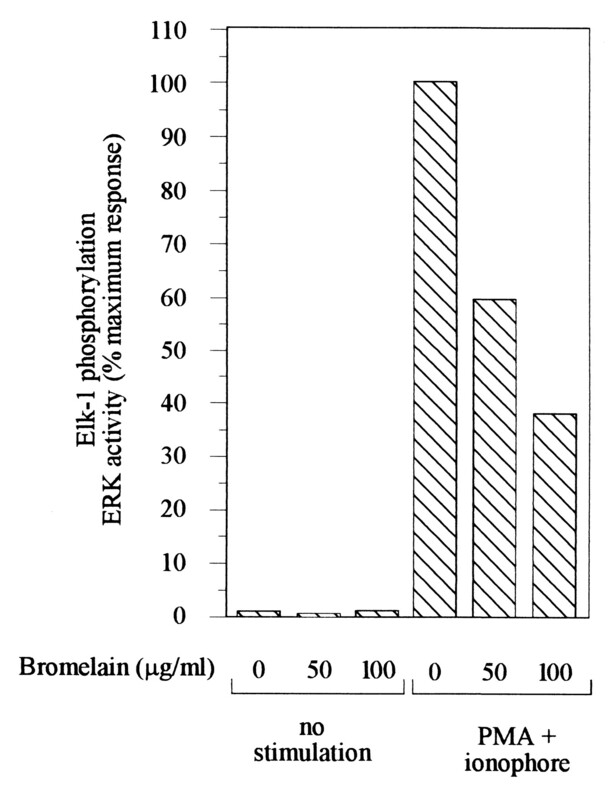 3⇑C), indicating that bromelain-mediated inhibition of ERK-2 is not due to a nonspecific degradative effect of proteolysis on the cell surface. Bromelain, but not trypsin, also inhibited tyrosine phosphorylation of PMA plus ionophore-induced ERK-1. In some experiments, trypsin appeared to increase tyrosine phosphorylation of ERK-2 (data not shown), which has been reported earlier (38). To confirm that the effect of bromelain was not restricted to the GA15 T cell hybridoma, we also showed inhibitory effects on tyrosine phosphorylation of ERK-2 in human Jurkat T cells (Fig. 4⇓). In addition, bromelain also inhibited tyrosine phosphorylation of ERK-2 in murine EL-4 and 2B4 T cell lines (data not shown). Bromelain inhibits ERK-2 phosphorylation in Jurkat T cells. Jurkat T cells were treated with bromelain (50 μg/ml) for 30 min, washed, and then stimulated with PMA plus ionophore for 5 min. Cells were then lysed, and postnuclear supernatants were subjected to SDS-PAGE and immunoblotted with anti-phosphotyrosine mAb. Results shown are from one experiment that is representative of four conducted. To begin to explore the mechanism of action of bromelain on ERK-2, we investigated its effect on p21ras, an upstream effector of the Raf-1/MEK1/ERK-2 kinase cascade. GA15 cells were treated with bromelain (0–100 μg/ml) and then stimulated with combined PMA plus ionophore, as described earlier. Cell lysates were then incubated with a GST-Ras-binding domain of Raf-1, known to specifically interact with the active Ras-GTP complex. Bromelain dose-dependently inhibited the affinity precipitation of active p21ras, thereby inhibiting p21ras activation (Fig. 5⇓). Further studies also showed that bromelain blocked activation of Raf-1 (data not shown). These data indicate that the inhibitory effect of bromelain on ERK-2 in GA15 cells is mediated by a block in the p21ras/Raf-1/MEK1 cascade, upstream from ERK-2. Bromelain inhibits p21ras. T cells were treated with bromelain (0–100 μg/ml) for 30 min, washed, and then stimulated with PMA plus ionophore for 5 min. Cell lysates were incubated with a GST-fusion protein coupled to the RBD of Raf-1. Affinity-precipitated active p21ras-GTP proteins were detected by immunoblotting with anti-Ras mAb. Results shown are from one experiment that is representative of four conducted. Activation of p21ras and the Raf-1/MEK-1/ERK pathway is essential for induction of IL-2 transcription in T cells (22). The inhibition of p21ras and ERK activation shown here could therefore be expected to inhibit IL-2 production. Therefore, we investigated whether bromelain could effect a functional outcome of GA15 cell signaling, namely IL-2 mRNA accumulation induced by anti-CD3ε mAb or PMA plus ionophore-induced stimulation. Bromelain treatment of GA15 cells significantly inhibited mRNA accumulation of IL-2 when the ERK pathway was stimulated directly with combined PMA and ionophore (p < 0.01). In contrast, however, bromelain did not block IL-2 cytokine mRNA accumulation when cells were stimulated via the TCR with anti-CD3ε mAb (Fig. 6⇓). Although not statistically significant, bromelain appeared to increase IL-2 production when cells were stimulated via the TCR (p < 0.09). To assess whether the defect in ERK activation could affect production of other cytokines, we also examined the effect of bromelain on IL-4 and IFN-γ mRNA accumulation. We found that bromelain similarly inhibited PMA plus ionophore-, but not TCR-induced IL-4 and IFN-γ mRNA accumulation (p < 0.01 and p < 0.05, respectively). IL-4 production seemed to be most sensitive to bromelain treatment with bromelain blocking IL-4 expression by 94%. Bromelain blocked PMA plus ionophore-induced IL-2 and IFN-γ by 68% and 56%, respectively (Fig. 6⇓A). Bromelain blocks PMA plus ionophore, but not TCR-induced cytokine gene expression. GA15 cells were treated with bromelain (50 μg/ml) or mock treated for 30 min. Cells were washed, resuspended in fresh culture medium, and then stimulated with PMA plus ionophore, cross-linked anti-CD3ε mAb, or mock treated with PBS for 4 h. IL-2, IFN-γ, and IL-4 mRNA accumulation was measured using a semiquantitative RT-PCR assay and standardized with the hypoxantine-guanineohosphoribosyl transferase (HPRT) house-keeping gene. A, The intensity of signals was quantitated by densitometry of bands revealed by chemiluminescence. Results from individual experiments (n = 5) are represented by unique symbols, and bars represent the mean. Closed symbols represent cytokine mRNA levels in bromelain-treated cells; open symbols represent cytokine levels in mock-treated cells. †, p < 0.05; ∗, p < 0.01; ‡, p = 0.09, paired Student’s t test. B, RT-PCR results (in duplicate) of a representative experiment (symbol ○ from A) from five performed. Cytokine mRNA production was dependent on cell stimulation, as negligible cytokine mRNA was detected in cells cultured in media alone (Fig. 6⇑B). In addition, the culture period of 4 h ensured that cytokine mRNA accumulated was a result of the specific stimuli used, rather than an autocrine effect of newly synthesized cytokine. However, at present, it is unknown whether bromelain affects cytokine mRNA transcription or stability. These results show that bromelain can inhibit PMA plus ionophore-induced cytokine production in GA15 cells, but does not affect TCR/CD3ε-induced cytokine production. In addition, this data suggests that TCR signals can bypass the requirement for p21ras and ERK-2 in IL-2 production. To ensure that the effects of bromelain were not simply due to a toxic effect, we investigated its effect on GA15 proliferation. Bromelain pretreatment (0–100 μg/ml for 30 min) did not decrease GA15 proliferation, nor affect their viability, as determined by trypan blue staining (data not shown). Similar results were obtained when we investigated the proliferation of purified murine CD4+ and CD8+ T cells (C. R. Engwerda and T. L. Mynott, manuscript in preparation) and human PBMCs (9). These data indicate that bromelain does not significantly affect the viability of T cells. Recently, it has emerged that extracellular proteases have specific regulatory roles in modulating immune responses (reviewed in Refs. 3, 39, 40). Cysteine and serine proteases may act as signaling molecules via an interaction with specific PARs leading to activation of the Raf-1/ERK-2 pathway to participate in mitogenesis, apoptosis, and cytokine production. Most reports on the role of protease-mediated cell signaling focus on the stimulatory effects of proteases on signal transduction. In this study, we show for the first time that extracellular proteases may also block signal transduction. We show that bromelain, a mixture of cysteine proteases from pineapple stems, inhibits signal transduction and cytokine production in a Th0 cell hybridoma. The inhibitory action of bromelain is not simply caused by a degradative action on cell surface molecules to alter receptor-ligand interactions, because bromelain blocked signaling by combined PMA plus ionophore, membrane-permeable agonists, which do not rely on extracellular receptors in their action. To our knowledge, bromelain is the first example of an extracellular protease that blocks p21ras and ERK-2 signaling. Other compounds that act as inhibitors of MAPK pathways, for example, the pyrrolo[2,3-d] pyrimidines (41) and flavones (42), are very small organic molecules of <1000 Da. The precise mecha-nism of action of bromelain remains to be determined. Preliminary studies suggest that bromelain acts upstream in the MAPK pathway and, at least, acts at the level of p21ras. Since p21ras is an effector for multiple MAPK pathways, it is likely that bromelain also affects other MAPK signaling cascades, such as the JNK pathway or p38 MAPK pathway. Studies are in progress to investigate the action of bromelain on other p21ras effector pathways. Bromelain inhibition of ERK-2 can be abrogated by a selective protease inhibitor. Therefore, bromelain most likely exerts its inhibitory effect via a proteolytic action on a T cell surface molecule(s), possibly via an, as yet, unidentified PAR. The bromelain target remains to be elucidated and studies are in progress. We do, however, thus far, rule out the possibility that bromelain cleaves certain T cell surface molecules. Earlier, Hale and Haynes (9) reported that bromelain cleaved the CD45 RA isoform and selectively removed other surface molecules from human PBMCs, including partial removal of CD4. Since CD45 and CD4 play an obligate, stimulatory role in TCR-mediated T cell activation (43, 44), bromelain could interfere with TCR signaling by affecting these molecules. However, this seems unlikely because it is possible to bypass the requirement for CD45 and CD4 in T cell activation by the use of phorbol ester plus ionophore. Use of combined phorbol esters and ionophore restores normal function to T cells that have been made refractory to TCR stimulation by tyrosine kinase inhibitors (29), or which are CD45- (45) or p56lck (21)-deficient. In the current study, PMA plus ionophore did not restore ERK-2 activity; therefore, the inhibitory effect of bromelain is not thought to be mediated via effects on CD45 or CD4 in GA15. It is interesting to note, that unlike other substances that inhibit TCR stimulation upstream of p21ras activation and block tyrosine phosphorylation of several substrates activated via the TCR (28, 29), bromelain appears to only affect tyrosine phosphorylation of ERK. Activation of ERKs is essential for cytokine gene transcription (27); therefore, ERK inhibition would be expected to block cytokine mRNA accumulation and cytokine production. Bromelain did inhibit cytokine mRNA accumulation induced by PMA plus ionophore, as predicted, but did not block cytokine mRNA induced by CD3ε-mediated TCR signals. This data would suggest the existence of a TCR signaling pathway in GA15 cells that induces cytokine mRNA production independent of ERK-2 activation. The existence of an ERK-independent pathway in CD3ε/TCR stimulation of cytokine production and other T cell functions has already been proposed (46, 47). Our data is consistent with this view and supports the hypothesis that T cells have developed alternative mechanisms for up-regulating the IL-2 gene independent of ERK activity. 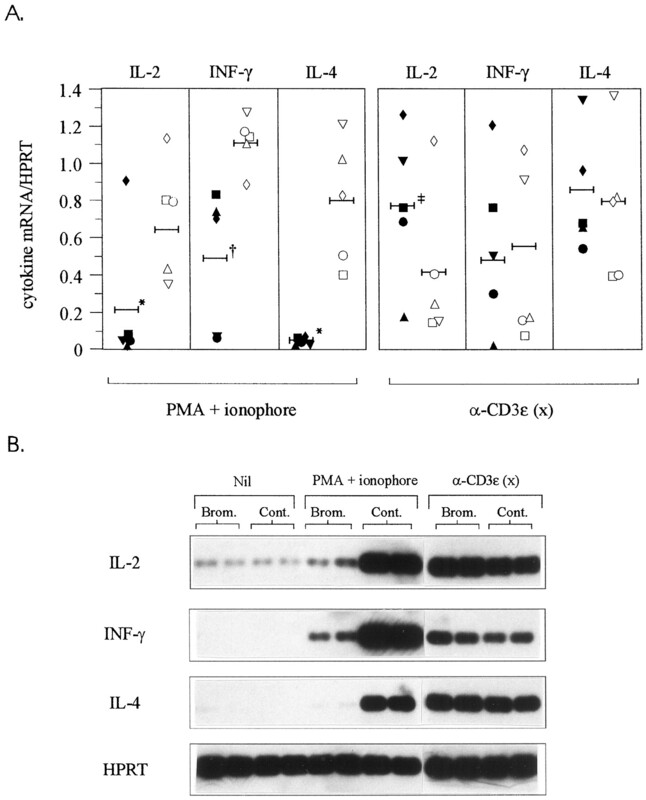 Interestingly, we found that IL-4 and IFN-γ production are also linked to the alternate pathway, as both cytokines were inhibited by bromelain treatment following GA15 cell stimulation with PMA plus ionophore, but not with anti-CD3ε mAb. These results indicate that, similar to IL-2 gene transcription, the ERK-2 signal transduction cascade is not the only effector pathway for IL-4 and IFN-γ production. An interesting observation in this study concerns the action of bromelain on cytokine production. We noted that bromelain had a more marked effect on IL-4 production than on IL-2 and IFN-γ production. IL-4 is produced by Th2 cells, and its expression was inhibited by 94%. IL-2 and IFN-γ are produced by Th1 cells, and their production was reduced by 68% and 56%, respectively. Earlier, Egerton et al. (48) showed that a hierarchy of cytokine responsiveness to ERK activation existed in T cells that expressed constitutively active MEK. It may also be possible that bromelain inhibition of the MAPK pathway may lead to a more selective effect against Th2-specific cytokine expression patterns than Th1-specific expression. In summary, we have shown that bromelain is a novel, nontoxic inhibitor of Th0 cell signaling and cytokine production. Further studies conducted with purified murine (BALB/c) CD4+ T cells show that bromelain also blocks IL-2 production but does not affect CD4+ T cell proliferation, thereby confirming these findings (C. R. Engwerda and T. L. Mynott, manuscript in preparation). It is interesting to note that bromelain has been used therapeutically for the treatment of inflammation and trauma (49). It has also been proposed to control tumor growth (50). Despite these reports, no convincing data are available on its mechanism of action. The antiinflammatory effects of bromelain may be mediated, in part, by the inhibition of thromboxane synthesis (49) or by inhibition of bradykinin production (51). ERK-2 and p21ras have a pivotal role in the integration of many extracellular stimuli, allowing for cell growth, differentiation, cytokine, and stress responses. Targeting of p21ras and the MAPK pathways is proposed as one approach to develop therapeutic agents to treat chronic inflammation or cancer. Therefore, the discovery that bromelain inhibits signaling by ERK-2 and p21ras may account for its antiinflammatory and anti-tumor action. Many reports about the role of proteases in disease have centered around their potential to cause damage (reviewed in Ref. 39). However, it is possible that cysteine proteases may, in contrast, have a therapeutic role in certain diseases. We thank Barbara Fox for her support in the early stages of the work. ↵2 Abbreviations used in this paper: ERK, extracellular regulated kinase; MAPK, mitogen-activated protein kinase; PAR, proteinase-activated receptor; JNK, c-Jun NH2-terminal kinase; pNA, p-nitroanilide; RBD, Ras-binding domain; E-64, (l-trans-epoxysuccinyl-leucylamido(4-guanidino)butane.